KGV 1920 issue 1d R2, 2d R2. KGV 1926 issue 1d R2, 2d R4, 3d R4. Background: *Brisbane City Council (BCC) was formed by the Queensland State Governments “City of Brisbane Act” in 1925. The act amalgamated some 20 small councils. Unlike other major Australian cities where the City Council administers only the Central Business District, the BCC looks after the largest part of the Brisbane Metropolitan area. The population in the area of the BCC is roughly equivalent to the combined populations of Tasmania, Northern Territory and the ACT. Device: The BCC device was most likely a single head device. It came into use about 1926 and its use would have overlapped with the device that preceded it, that is BMC. 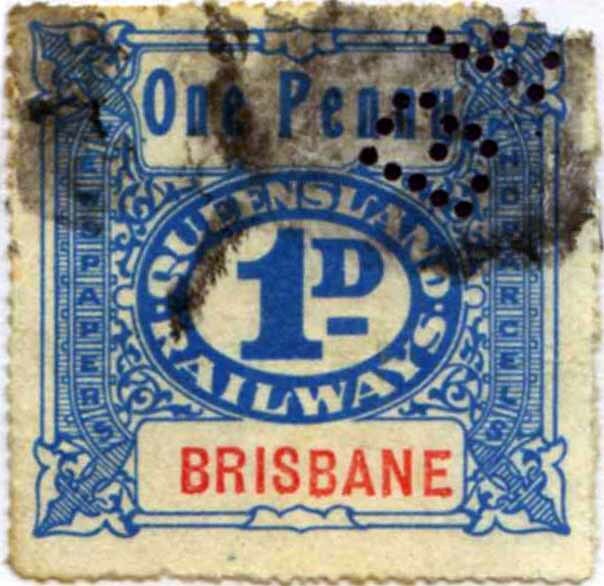 Because of the narrow nature of Queensland revenues of the period the BCC pattern is often found as a partial and may appear as CC B or the like. The BCC device is also found on postage stamps over the period 1926 – 1940. KEDVII 1901 series 2d, 1/-, 2/6d. 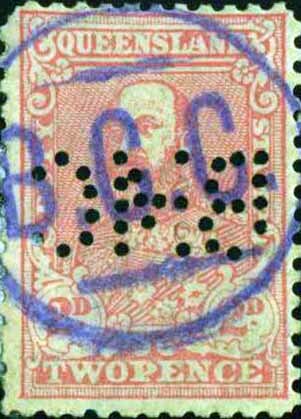 KEDVII 1901 issue 2d R4, 1/- R4, 2/6d R4. KGV 1920 issue 1d R4, 2d R3. Background: *In 1859 Queensland separated from New South Wales and became a Colony in its own right. At this time Brisbane was proclaimed a municipality and the Brisbane Municipal Council (BMC) was established by the later “Municipal Institutions Act” of 1864. Following the Local Authorities Act of 1902 Brisbane was proclaimed a City and the Governing body was re-titled the Brisbane City Council (BBC). The area administered by the BMC and later BBC was the Brisbane City Centre and the immediate surrounding suburbs. This was increased in 1925 following the City of Brisbane Act of 1924. Device: Despite the known timing of these name changes, in the early 1900’s the Council sought a perforating device with the letters BMC and this was used from the early 1900’s. The BMC.a device was most likely a single head device as strikes from adjoining stamps do not show any consistent relationship to each other. 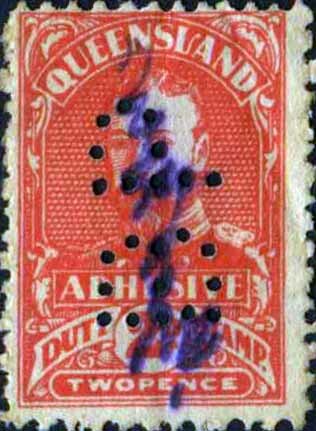 The pattern is rather wide and when applied to the contemporary revenue stamps, such as the Edward VII and KGV issues of Queensland, it barely fits across the stamp in position 1 and therefore it is often found in position 2. 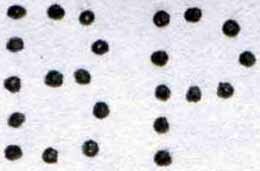 Early examples of the pattern, up until about 1926, are characterised by clear and complete strikes with slightly thicker holes and it seems that around this time (1926) the device was altered and thinner pins installed. These pins were not as robust as the earlier ones and over time the device starts to show consistent missing pins, particularly in the middle section of the M.
Examples of the pattern on revenue stamps often also carry the BCC overprint. 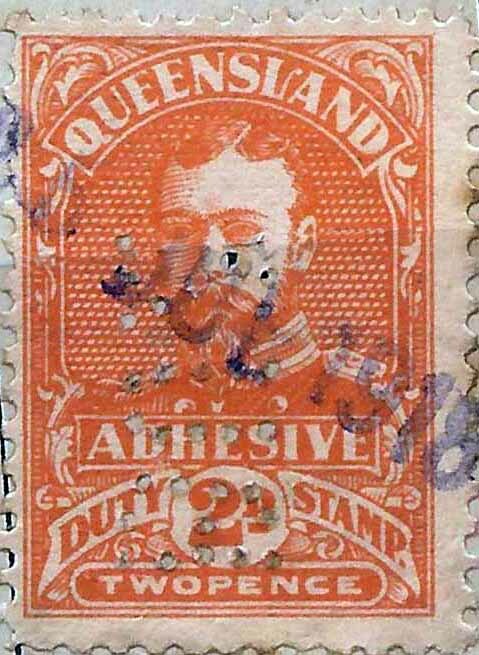 The BMC device is also found used on postage stamps of Queensland and later Australia from as early as 1901 until at least 1928. Early use and late usage on postage stamps is rare and the pattern is more common on the KGV issues of 1916 - 1921. * Brisbane City Council website. Revenue: KGV 1917 issue 1d horizontal, 2d up, 3d. Rarity Scale: KGV 1920 issue 1d R4, 2d R4, 3d R4. 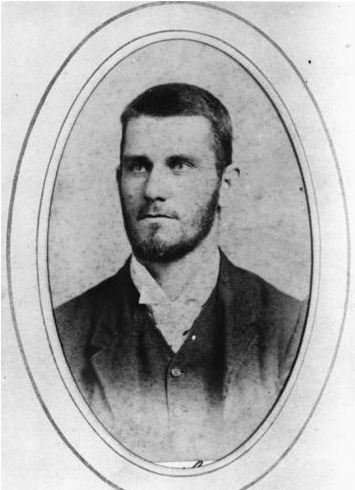 Background: James Burns arrived in Australia from Scotland in 1862 and after being involved in his brother’s retail business in Brisbane he moved to Townsville and established his own business (retail/wholesale) in 1872. In 1874 he met another Scottish immigrant, Robert Philip, who he later took as a partner. In 1882 the partnership was converted into a corporation and Burns Philip and Company Ltd was formed. Burns Philip’s interests expanded to include coastal trading and shipping, around Australia and into much of the South Pacific. This necessitated the establishment of many remote offices, some of which were provided with perforators. Device: This device was located in Cairns were Burns Philip had offices at the wharfs (and possibly in Cairns proper). It is a single head device quite similar to the BP.b and BP.d devices that were used in the Burns Philip Brisbane office. The Cairns office of Burns Philip was known to have applied to use a perforating device in June 1918. This application was most likely for a very short lived BP device (BP.7 HAPP) which is not reported used on revenue stamps. This approval then seems to have be applied to the use of this BP.a device and the later BP.c devices used in Cairns. This BP.a device is also known on postage stamps from 1927 - 1940. Revenue Use: Numeral 1d, 1d (security backprint). Rarity Scale: Numeral 1d R3. 1d (security backprint) R4. Railway Usage: 1927 issue 1d, 1/-. Rarity Scale: 1927 issue 1d R3. 1/-R4. Device: A single head device. The strike of this pattern is often found punctured diagonally across the stamp which suggests that it was set up into the device on a slight angle; 15-20 degrees from the horizontal and angling upwards from left to right. However because it is a single head device and stamp multiples could be folded under the head, there are a wide variety of angles and directions are found. The other characteristic of the pattern is the close proximity of the 2 pins in the top right hand corner of the P and they are often seen joined. It is unusual to see pins so close together in a pattern and this aspect of the pattern may have been the result of a repair to an earlier device. The application and approval for this Brisbane BP device was in July 1920 yet I can find no evidence of BP.b usage this early. There are some strikes found of a similar device dating from around 1920 and it may be that this was the original device that was repaired/altered to give us the BP.b pattern. To date none of these earlier patterns have been found on Revenues. Both the BP.b pattern and its possible earlier form are found on postage stamps. KGV 1920 series 1d R4. Device: A single head device located in Cairns. Most likely this device replaced BP.a in about 1941 as their usages do not overlap. 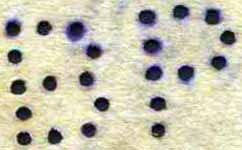 The pattern is also found on postage stamps from 1941 - 1948. Rarity Scale: Numeral 1926 issue 2d R2, 3d R2, 1/- R2, 2/- R4, 5/- R4. Device: Most likely a single head device. As with BP.b (Brisbane), the punch head of the device was set up on an angle of about 15-20 degrees from the horizontal. This means that you will find many patterns at a variety of angles across the stamp. Most likely this device replaced BP.b in about 1947. The pattern is also found on postage stamps. 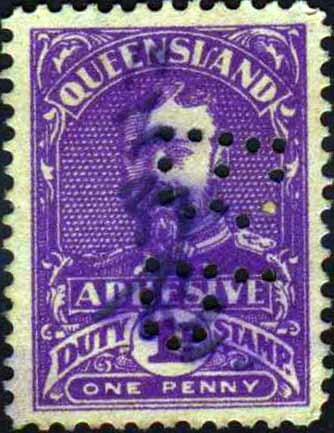 Revenue Usage: KGV 1917 issue 2d. Rarity Scale: KGV 1917 issue 2d R4. Background: *The Buzacott group of companies were founded in 1849 by A B Armstrong who had an engineering business at 9 Market St, Sydney. Armstrong’s daughter Sarah married Walter Buzacott in 1862 and in 1864 he joined as a partner. A.B. Armstrong died in 1872 and his eldest son Thomas took his place. The business then traded as Buzacott & Armstrong but in 1877 Thomas Armstrong retired due to ill health and Walter Buzacott took over the running of the business. Walter Buzacott had two sons, Ernest and Walter (jrn) and both worked in the business and in 1890 the company was renamed Buzacott & Company and later in 1902 was restructured as Buzacott & Company Ltd with Earnest as Chairman and Walter as Director. Walter (snr) died in 1916. At this time the company became involved in engine manufacturing as agents for the Hercules Engine Works (USA). The company grew to become respected manufacturers and supplier of small stationary engines (1- 12 hp) as well agricultural equipment such as fences, gates, pumps, wool presses, elevators, corn crushers and chaff cutters. There range included the well known product; "Cyclone" fencing. In the early 1920’s Buzacott & Co Ltd formed Rosebery Lanolines Pty Ltd, Rosebery Engine Works Ltd, and Buzacotts (Queensland) Ltd, the user of this device. 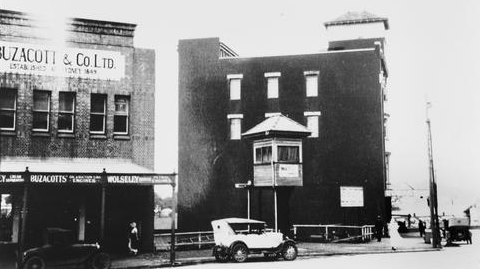 Buzacotts (Queensland) Ltd had been established as a branch office at Adelaide Street Brisbane in 1911. By 1940 Buzacott (Queensland) also had branches in Townsville, Cairns, Mackay and Rockhampton but in 1957 Buzacott (Queensland) was bought out and ceased to trade. By the late 1920s Ernest’s son Alan (born 1899) was taking a leading role in the company as chief engineer at Rosebery Engine Works Ltd. This company was the engine and pump manufacturing division of Buzacott & Company Ltd but had became the centre of the Buzacott group of companies. In 1932 Rosebery Engine Works Ltd expanded into the manufacture of commercial refrigerators and in 1933 domestic models. This lead to an agreement with Westinghouse Company and by 1935 they held the rights to manufacture and sell nearly all products of the Westinghouse range. The name of the company was changed to Westinghouse Rosebery Ltd and then to Westinghouse Sales and Rosebery Ltd. In 1940 Westinghouse Sales and Rosebery Ltd was taken over by the EMAIL and Alan remained with EMAIL until he retired. Buzacott & Company Ltd continue to trade as Buzacott-Wolseley and the business were heavily involved in Defense contracts and the support of primary producers during World War 2. Earnest remained with the company until 1948 and William was a Director until 1949. Device: The BUZ.a device is in a single head format. 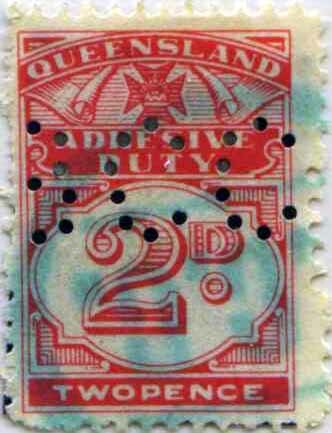 It is found only very rarely on revenue stamps of Queensland but is more often seen on postage stamps of Australia over the period 1916–1927. Still, given the 12 year period of use it is somewhat surprising that it is not more common. 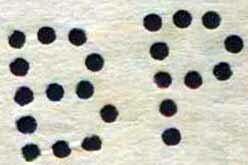 The records show an application by Buzacott to use a perforating device being made in late 1914. This does not mean that usage started this early. It may have, but our research has found that usage can both pre and post date application. Use of the device seems to be limited to Brisbane and it is odd that none of the other parts of the Buzacott group of companies chose to purchase perforating devices. Late usage is characterised by poor strikes. * Powerhouse Museum Collection Administrative History of Buzacott and Co prepared by Peter Arfanis, 1992.